Changing regulations, shifting customer demand patterns, and growing complexity in the supply chain were putting Ace Hardware International’s in-stock rates at risk. The company needed to increase its demand and supply planning precision across three distribution centers and more than 600 stores in 62 countries. 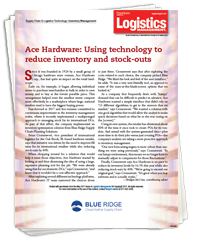 Implementing new supply chain technology, Ace is now closing in on its goal of 40% fewer stockouts within the first year.